Contenders. – Dirty wet dog , boats and sailing. Here is the first round of contenders for a cruising dnghy/multi-purpose boat. Firstly the obvious one : the Wayfarer. To me the Wayfarer is synonymous with 2 things : sailing schools and dinghy cruising, i suspect that a lot of UK sailors got their first experiences of sailing in a Wayfarer as they are a big and stable boat. I was thinking just now about a work colleague whom i might be taking out for an introductory sail soon : he has been listenning to me a bit and decided he wanted a try so he went to some club or school that put him in a Laser on a nice windy day : after i picked myself from rolling around the floor in laughter i told him why that was a bad idea, as it was he spent most of the time in the water !. Hopefully he will get a gentler intro in the Liberty but a Wayfarer is a very good boat to develop ‘seat of pants’ skills and still reckoned to be a good boat for the family. Wayfarers are also famous or infamous for the amazing or stupid (depends on your view) Frank Dye who did serious offshore/ocean passages in an early one and lived to write about it. From memory he went to Iceland and Norway and then cruised the boat extensively by packing it in a container and sending it off to places such as the USA. Craziness aside there are a whole load of video’s on youtube of really adventurous trips in these boats : one i was just watching cruised all around the wild bits of north-western Brittanny. Of the boats represented here its the most common and the cheapest as there are lots of them on the market, having done the basic research about the boat the one to look for is the mark 1 composite as it has a low floor and a better stowage compartment forward. Also with their age they tend to be the cheapest apart from a few mark 2’s and some knackered wooden ones. Generally i will avoid the woodies because i can’t keep the boat inside and very few of them have been epoxied. These pictures are of 2 different boats : one is composite with a wooden deck which shouldn’t be a problem and the other is all GRP. Neither boat has an outboard which the boat would need, one i think has a tent and oars which makes it a real contender, one trailer looks better than the other which is important as the boat will be towed a lot. Second : The Devon Yawl. I have always liked the look of the Devon Yawl and all-but bought a local one many years ago : there is a fleet of them sailing nearby and raced and from what i can see they go well. The Yawl is the most rugged of the contenders and probably the most stable as i believe they have a metal board : that probably means that they are also the heaviest of the dinghy’s here. 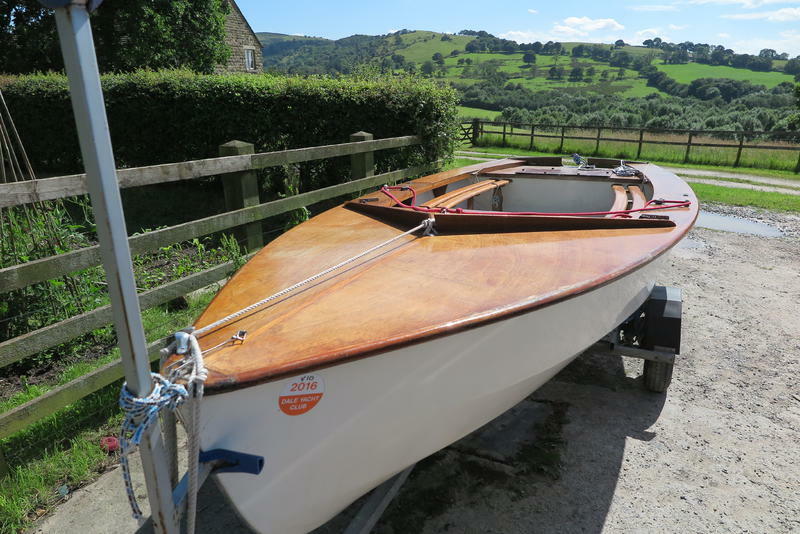 This one is a lot more expensive than the Wayfarer at around £4 k.
The boat doesn’t have an outboard so that would be additional expense, not even sure if this one has oars. The site description has the trailer as being well sorted. Downside is that this boat is a long way away from me. Third : the powerful one. International 18. I love the name ‘Das Boote’. The International 18 is a big and powerful sailing dinghy i believe originally intended as an olympic class and originally designed by the late Uffa Fox so that’s a hell of a pedigree. The ’18’ is still raced aggressively with i think up to 2 crew out on the wire : its a 3 man boat. As a cruising boat it would need modifying mainly in that the mainsail would need a reef or 2 and i don’t imagine using the trapeze. There is a local one i believe that has been converted to a modern lugger with a carbon stick and by all accounts goes like s**t off a shovel. These are the boats that i know least about although they are again extremely popular as training boats. From memory the hull is based on an inshore fishing boat from the north-east coast (the coble) and today they tend to be the MPV of the leisure sailing world. I don’t think they are particularly quick or powerful sailing boats although ‘safe’ but are narrow enough to row and would usually work with an outboard on the back. They do seem to be a popular family boat and we did see a fair number of them in Norfolk….i have to wonder if there they are slightly ‘lifestyle’ boats ! Peter Cash wrote : “The yawl is a beaut, real seagoing by the look of her. Pity only in the UK. Drascombes and Dovekies are often towed by a Prius or Subaru with owners in expensive outfitter rigs, and Topsiders. No socks of couse. Me, l am the wally in rubber boots or wet hikers. Me…must do a piece about british sailors and their ‘uniforms’ some time. Stephen Mundane wrote : ““Lifestyle boats” — love it! As Peter pointed out, like in the US I imagine that the Drascombe not-a-lugger owners will probably be sockless, unless it’s a cold day and they’ve got their Dubarry Ultimas on. British sailors and their uniforms would be an interesting read. As for the contenders, I don’t think you can go too wrong with a Wayfarer. Plenty of new bits available, active owners group for advice and they’ll take you anywhere your bloody-mindedness and balls of steel have a fancy to go. The yawl is a beaut, real seagoing by the look of her. Pity only in the UK. Yawls are also made in the US. Worth checking out on the web. “Lifestyle boats” — love it! As Peter pointed out, like in the US I imagine that the Drascombe not-a-lugger owners will probably be sockless, unless it’s a cold day and they’ve got their Dubarry Ultimas on. British sailors and their uniforms would be an interesting read. As for the contenders, I don’t think you can go too wrong with a Wayfarer. Plenty of new bits available, active owners group for advice and they’ll take you anywhere your bloody-mindedness and balls of steel have a fancy to go.